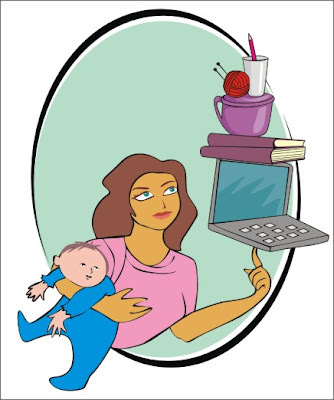 WHICH MOM OF THE 21ST CENTURY ARE YOU? Or a stay-at-home mom, and blogging on the side. Or an absentee mom, with just a nanny left on the child. I choose to be a stay-at-home mom and blogging on the side. If you can fit in yourself with any of the situations given then maybe there is no need to elaborate more on how each situations are being lived by every women who are into this plane. But if you can't see yourself in any of those situations, then that goes to show that there are countless types of mothers as there are countless stories on motherhood and mothering being told as evident in countless mom blogs around here. it is true that women transforms when she became a mother, we also makes our own decision in choosing which will define us... but its all boils down on giving what's best to our child and to our every situation. I'm on the 2 & 3 before and after. :) Ahh motherhood, it never end.. I am a SAHM and blogging.. FULL time lol..
Hi Vernz, I'm a working-at-home Mom of a big,just-started-to-work girl, with blogging on the side. How's that for a change? @ einz, you are truly correct, but often, we are bound by the dictates of society, which is so constraining. @ Anne, ahahahah... we belong ... same here.